Singer Halsey and rapper G-Eazy have apparently ended their relationship yet again. E! News reports that Halsey and G-Eazy are no longer together. The celebrity couple were going strong after reconciling around the time of the 2018 MTV Video Music Awards, but, after G-Eazy allegedly flirted with other women, their romance reportedly turned sour. On Tuesday, Oct. 23, 2018, a source told the celebrity news site, "G-Eazy and Halsey were doing well until a couple of days ago when G-Eazy performed at the Karma International party in Los Angeles on Saturday and was flirting with several girls in public." The insider noted, "G-Eazy was telling everyone that he was single and that he and Halsey are always 'on-and-off' but they are currently split." According to a source who spoke with People magazine, G-Eazy "didn't care who saw" him partying with other women. According to E! News, Halsey was in Tokyo, Japan while G-Eazy was in Los Angeles. The stars reportedly no longer follow one another on Instagram. 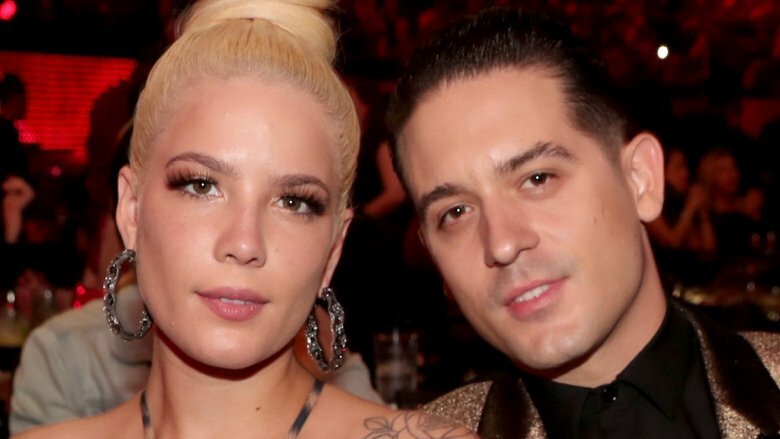 Halsey and G-Eazy previously broke up in July 2018, after dating for one year. "I normally keep this kind of thing private but provided our public nature I feel the need to inform my fans," Halsey said at the time. "G-Eazy and I are taking some time apart." However, the famous pairing were later spotted holding hands in August 2018, and the two were thought to be "working on their relationship" (via E! News). By September, Halsey and G-Eazy appeared to officially back on, as the "New Americana" singer shared a sweet photo of herself with the rapper, kissing as they enjoyed a gondola ride in Italy. "Sweetness of my whole damn life," she wrote in the caption. On Oct. 9, 2018, Halsey and G-Eazy walked the American Music Awards red carpet, solidifying their status as a couple. So, are Halsey and G-Eazy done for good? Well, we'll just have to wait and see. There's just no predicting anything for this couple.